One British response to the guerrilla war was a 'scorched earth' policy to deny the guerrillas supplies and refuge. In this image Boer civilians watch their house as it is burned. The bearer, <prisoner name> has been released from prison of war camp <Camp name> on signing that he acknowledge terms of surrender and becomes a British subject. Paardeberg A British led attack trapped a Boer Army in Central South Africa on the banks of the Modder River from 18–27 February 1900. Over 800 Canadian Soldiers from Otter's 2nd Special Service Battalion were attached to the British attack force. 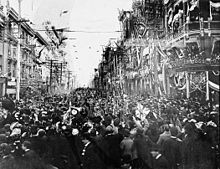 This was the first major attack involving the Canadians in the Boer War as well as the first major victory for Commonwealth soldiers. 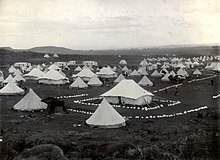 The Canadian soldiers perched on a hill above the Boer camp and were cred with being the main reason that the Boers under General Cronjé surrendered. Sam Hughes – Senior Militia officer and later a Federally elected cabinet minister. As a very patriotic individual, Hughes became involved in the Boer war as a member of Brigadier-General Herbert Settle's expion after Hughes unsuccessfully tried to raise his own brigade of soldiers. Hughes was noted by his colleagues for having a dislike of professional soldiers and he was noted for being an exceptional leader of irregular soldiers, whom he preferred to lead in combat. However, Hughes was dismissed and was sent home in the summer of 1900 for; sending letters back home which were published outlining British command incompetence, his impatience and boastfulness and his providing surrendering enemies favourable conditions. When he arrived back in Canada, Hughes became very active politically, and he would eventually start his political career with the Conservatives. When he became a member of parliament, Hughes would be in the position to become the Canadian Minister of Defence and Militia in 1911, just prior the outbreak of World War I. This was a position that Hughes would be dismissed from in 1916, due once again to his impatience, among other reasons. ^ The Rhodesia Regiment, drawing most of its personnel from the Southern Rhodesia Volunteers, served in the war, contributing around 1,000 men. ^ Larger numbers of volunteers came from the Netherlands, Germany and Sweden-Norway. 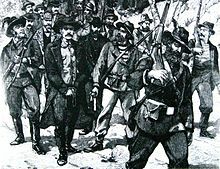 Smaller forces came from Ireland, Australia, Italy, Congress Poland, France, Belgium, the Russian Empire, the United States, Denmark and Austria-Hungary. ^ 3,990 killed in battle; 157 died in accidents; 924 of wounds and disease; 1,118 while prisoners of war. ^ British cavalry travelled light compared with earlier campaigns, but were still expected to carry all kit with them on campaign owing to distances covered on the Veldt. ^ Keppel-Jones 1983, pp. 590–59. ^ Grattan 2009, pp. 147–58. ^ Haydon 1964, p. [page needed]. ^ Scholtz, Leopold (2005). Why the Boers Lost the War. Basingstoke: Palgrave-Macmillan. pp. 2–5, 119. ISBN 978-1-4039-4880-9. ^ Wessels 2011, p. 79. ^ Millard, Candice (2016). Hero of the Empire: The Boer War, a daring escape, and the making of Winston Churchill. New York: Doubleday. ISBN 9780385535731. Retrieved 14 April 2017. ^ Biggins, David. "Khaki Election of 1900". angloboerwar.com. Retrieved 27 November 2018. ^ a b "Women & Children in White Concentration Camps during the Anglo-Boer War, 1900-1902". South African History Online. 21 March 2011. Retrieved 20 February 2019. ^ South African History Online 2011. ^ Pakenham 1979, p. xxi. ^ a b Greaves, Adrian. The Tribe that Washed its Spears: The Zulus at War (2013 ed.). Barnsley: Pen & Sword Military. pp. 36–55. ISBN 978-1629145136. ^ a b Morris & Linnegar 2004, pp. 58–95. ^ Entry: Cape Colony. Encyclopedia Britannica Volume 4 Part 2: Brain to Casting. Encyclopædia Britannica, Inc. 1933. James Louis Garvin, or. ^ Meintjes 1974, p. 7. ^ a b Pakenham 1979, pp. 1–5. ^ Pakenham 1979, pp. 493–95. ^ Cartwright 1964, p. [page needed]. ^ Yap & Leong Man 1996, p. 134. ^ Nathan 1941, p. [page needed]. ^ Bester 1994, p. [page needed]; Wessels 2000, p. 80. ^ Connolly, C.N. Manufacturing Spontaneity. ^ Surridge 2000, p. 24. ^ Dunlop, Colonel John K., The Development of the British Army 1899–1914, London, Methuen (1938) p 72. ^ Searle 2004, p. 276. ^ Wessels 2000, p. 74. ^ Pretorius 2000, p. 179. ^ Pakenham 1991a, p. 573. ^ Craig Wilcox, Australia's Boer War, pp. 84–85. ^ a b "Anglo-Boer War Philatelic Society: Collecting Interests". Archived from the original on 10 December 2005. ^ Limited, Burgh House Software for Moonbeams. "Saint Helena Island Info: All about St Helena, in the South Atlantic Ocean • Boer Prisoners (1900–1902)". ^ Cameron 1986, p. 207. ^ Blake 2010, p. 46. ^ Pakenham 1991, p. 571. ^ Blake 2010, p. 140. ^ Marsh 1994, pp. 483–85. ^ Davidson & Filatova 1998, p. 80. ^ Warwick 1983, p. [page needed]. ^ Pretorius 2011, p. [page needed]. ^ Hasian Marouf, Western journal of communication, 2003. ^ "Black Concentration Camps during the Anglo-Boer War 2, 1900-1902". South African History Online. 21 March 2011. Retrieved 20 February 2019. ^ Pakenham 1979, p. 493. ^ Wessels 2010, p. 32. ^ Pakenham 1979, p. 505. ^ Judd & Surridge 2013, p. 195. ^ O'Brien 1988, p. [page needed]. ^ Pakenham 1979, p. 601. ^ Grundlingh 1980, pp. 258–78. ^ a b Measuringworth 2015. ^ Onselen 1982, p. [page needed]. ^ Onselen 2003, pp. 483–526. ^ Swardt 1998, p. 97. ^ McElwee 1974, pp. 223–29. ^ Hayes 1902, pp. 213–14. ^ Davis 1900, p. 34. ^ Jacson 1908, p. 88. ^ Pocock 1917, p. viii fn. 11. ^ Australian War Memorial (2008). "Australian Military Statistics". Australian War Memorial. ^ Australian War Memorial (2008). "Australia and the Boer War, 1899–1902". Australian War Memorial. ^ a b c d e f Webb 2010, pp. 75–90. ^ a b Marshall, Robert. "Boer War Remembered". Maclean's. ^ a b c Miller, Carman. "South African War". Canadian Encyclopedia. ^ a b Granatstein 2010, p. [page needed]. ^ Berger 1970, pp. 233–234. ^ "The Guerrilla War". 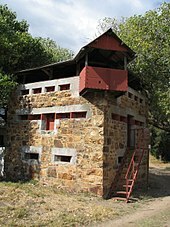 Anglo-Boer War Museum. ^ Rickard, J. "The Black Week". History of War. ^ a b c "Canada & The South African War, 1899–1902". Canadian War Museum. ^ Cavendish, Richard. "The Peace of Vereeniging". History Today. ^ a b c Wessels 2009. ^ a b Chase 2012. ^ a b c d e f Pulsifer 2017. ^ New Zealand History Online (2008). "Brief history – New Zealand in the South African ('Boer') War". New Zealand History. Retrieved 10 May 2008. ^ New Zealand History Online (2008). "New Zealand in the South African ('Boer') War". New Zealand History. Retrieved 10 May 2008. ^ D.O.W. Hall, (War History Branch, Wellington, 1949). ^ a b Pugsley, Christopher (2016). The ANZAC Experience: New Zealand, Australia and Empire in the First World War. Auckland, New Zealand: Oratia. pp. 42–43. ^ Phillips, Jock (1990). The Sorrow and the Pride: New Zealand War Memorials. Wellington, New Zealand: GP Books. p. 48. ^ a b "Borden, Harold Lothrop". Dictionary of Canadian Biography, Volume XII (1891–1900). ^ a b Duffy 2009. ^ Witton 2003, p. [page needed]. ^ Pakenham 1991a, p. 568. ^ Powell 2015, p. [page needed]. ^ Desai & Vahed 2015, p. [page needed]. ^ a b "Victoria Cross" (PDF). Government of Canada. Archived from the original (PDF) on 4 March 2016. Retrieved 6 December 2018. ^ a b c Jones, Spencer (2011). "Scouting for Soldiers:Reconnaissance and the British Cavalry 1899–1914". War in History. doi:10.1177/0968344511417348. ^ Baker, Chris. "Battle of Mons". ^ "History of Royal Canadian Dragoons". Archived from the original on 22 November 2012. ^ "Canadian casualties in the Boer War". Goldi Productions Ltd.
^ Berger 1970, pp. 233–34. ^ Grundlingh, Albert. "The Bitter Legacy of the Boer War". History Today. ^ Barnard, Hennie. "The Concentration Camps 1899–1902". ^ Gous, Nico. "Boer War women, children put in concentration camps 'for own good': British MP sparks outrage". Berger, Carl (1970). The Sense of Power; Studies in the Ideas of Canadian Imperialism,: 1867–1914. University of Toronto Press. pp. 233–34. ISBN 978-0-8020-6113-3. Blake, Albert (2010). Boereverraaier. Tafelberg. p. 46. "Case Name: Anglo-Boer: Britain's Vietnam (1899–1902)". American University of Washington D.C Trade Environment projects. Archived from the original on 27 October 2016. Retrieved 21 July 2016. Davidson, Apollon; Filatova, Irina (1998). The Russians and the Anglo-Boer War, 1899-1902. Cape Town: Human & Rousseau. ISBN 0 7981 3804 1. Chase, Sean (4 November 2012). "Dragoons remember the heroes of Leliefontein". Daily Observer. Cameron, Trewhella, ed. (1986). An Illustrated History of South Africa. Johannesburg,: Jonathan Ball. p. 207. Cartwright, A. P (1964). The Dynamite Company. Cape Town: Purnell & Sons. Davis, Richard Harding (1900). With Both Armies In South Africa. Charles Scribner Sons. p. 34, fn. 59. "South African War (British-South African history)". Encyclopedia Britannica. Britannica.com. 31 March 2011. Retrieved 23 July 2013. "Caring for the soldiers health". Nash's war manual. London: Eveleigh Nash. 1914. p. 309. Farwell, Byron (March 1976). "Taking Sides in the Boer War". American Heritage Magazine. 20 (3). ISSN 0002-8738. Archived from the original on 7 January 2009. Ferguson, Niall (2002). Empire: The Rise and Demise of the British World Order and the Lessons for Global Power. Basic Books. p. 235. Grundlingh, Albert (1980). "Collaborators in Boer Society". In Warwick, P. (ed.). The South African War. London. pp. 258–78. Grattan, Robert (2009). "The Entente in World War I: a case study in strategy formulation in an alliance". Journal of Management History. 15 (2): 147–58. Haydon, A.P. (1964). "South Australia's first war". Australian Historical Studies. 11 (42). 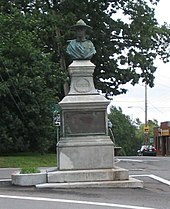 Hayes, Matthew Horace (1902). Horses on board ship: a guide to their management. London: Hurst and Blackett. pp. 213–14. Inglis, Brian (1974). Roger Casement. London: Coronet Books. pp. 53–55. Jacson, M. (1908). "II". The Record of a Regiment of the Line. Hutchinson & Company. p. 88. ISBN 1-4264-9111-5. Jones, Maurig (1996). "Blockhouses of the Boer War". Colonial Conquest, magweb. Archived from the original on 13 May 2008. Retrieved 10 May 2008. Jones, Huw M. (October 1999). Neutrality compromised: Swaziland and the Anglo-Boer War, 1899–1902. Military History Journal. 11. Keppel-Jones, Arthur (1983). Rhodes and Rhodesia: The White Conquest of Zimbabwe, 1884–1902. Montreal, Quebec and Kingston, Ontario: McGill-Queen's University Press. pp. 590–99. ISBN 978-0-7735-0534-6. McElwee, William (1974). The Art of War: Waterloo to Mons. London: Purnell. pp. 223–29. ISBN 0-253-31075-X. "Relative Value of UK£: using Economic Power in 2014 (using the share of GDP)". Five Ways to Compute the Relative Value of a UK Pound Amount, 1270 to Present. Measuringworth.com. 2015. Retrieved 12 September 2015. Marsh, Peter T. (1994). Joseph Chamberlain: Entrepreneur in Politics. Yale University Press. pp. 482–522. Meintjes, Johannes (1974). President Paul Kruger: A Biography (First ed.). London: Cassell. ISBN 978-0-304-29423-7. Morris, Michael; Linnegar, John (2004). Every Step of the Way: The Journey to Freedom in South Africa. Ministry of Education. pp. 58–95. ISBN 0-7969-2061-3. O'Leary, Michael (29 December 1999). "Regimental Rouge – Battles of the Boer War". Regimental Rouge. Peddie, John (22 August 2009). "John McCrae Biography". firstworldwar.com. Pocock, Roger S. (1917). Horses. London: J. Murray. p. viii fn. 11. ISBN 0-665-99382-X. Onselen, Charles van (1982). "Chapter 1:New Babylon". Studies in the Social and Economic History of the Witwatersrand, 1886–1914. London: Longman. ISBN 9780582643840. Onselen, Charles van (October 2003). "'The Modernization of the Zuid Afrikaansche Republiek: F. E. T. Krause, J. C. Smuts, and the Struggle for the Johannesburg Public Prosecutor's Office, 1898–1899". Law and History Review. American Society for Legal History. 21 (3): 483–526. doi:10.2307/3595118. Pakenham, Thomas (1991) . The Boer War. London: Cardinal. p. 571. ISBN 0-7474-0976-5. Pakenham, Thomas (1991a). The Scramble for Africa. p. 573. ISBN 0-380-71999-1. Ploeger, Jan (1985). "Burgers in Britse Diens (1902)". Scientia Militaria. 15 (1): 15–22. Pretorius, Fransjohan (2000). 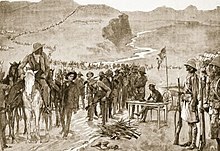 "The Experience of the Bitter-Ender Boer". In Gooch, John (ed.). The Boer War: Direction, Experience and Image. London: Cass. p. 179. Pretorius, Fransjohan (2011). "Anglo-Boer war". In Jacobs, S.; Johnson, K. (eds.). Encyclopedia of South Africa. Pulsifer, Cameron (2017). "For Queen and Country: Canadians and the South African War". Canadian War Museum. Retrieved 2 February 2017. "The South African War 1899–1902". South African History Online. 10 November 2011. Retrieved 29 January 2017. Searle, G.R. (2004). A new England? : peace and war, 1886–1918. Oxford University Press. pp. 269–307. Spies, S.B. (1977). Methods of Barbarism: Roberts and Kitchener and Civilians in the Boer Republics January 1900 – May 1902. Cape Town: Human & Rousseau. p. 265. Steele, David (2000). "Salisbury and the Soldiers". In Gooch, John (ed.). The Boer War: Direction, Experience and Image. London: Cass. Stirling, John (17 February 2009). "Gordon Highlanders (extract)". Our Regiments in South Africa. Naval and Military Press. Surridge, Keith (2000). "Lansdowne at the War Office". In Gooch, John (ed.). The Boer War: Direction, Experience and Image. London: Cass. p. 24. Swardt, Eric (1998). "The JJ Potgieter Manuscript" (PDF). p. 97. Archived from the original (PDF) on 16 August 2010. Retrieved 23 August 2009. Villiers, J.C. de (June 1984). "The Medical Aspect of the Anglo-Boer War, 1899–1902 Part ll". Military History Journal. 6 (3):&#91, page&nbsp, needed&#93, . Watt, S (December 1982). 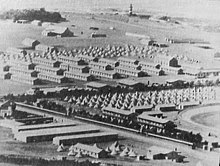 "Intombi Military Hospital and Cemetery". Military History Journal. Die Suid-Afrikaanse Krygshistoriese Vereniging. 5 (6). Webb, Peter (2010). "The Silent Flag in the New Fallen Snow: Sara Jeannette Duncan and the Legacy of the South African War". Journal of Canadian Studies. University of Toronto Press. 44 (1): 75–90. Archived from the original on 5 February 2017. Retrieved 4 February 2017. Wessels, André (2000). "Afrikaners at War". In Gooch, John (ed.). The Boer War: Direction, Experience and Image. London: Cass. Wessels, André (2010). A Century of Postgraduate Anglo-Boer War (1899–1902) Studies: Masters' and Doctoral Studies Completed at Universities in South Africa, in English-speaking Countries and on the European Continent, 1908–2008. African Sun Media. p. 32. ISBN 978-1-920383-09-1. Wessels, André (2011). The Anglo-Boer War 1889–1902: White Man's War, Black Man's War, Traumatic War. African Sun Media. p. 79. ISBN 978-1-920383-27-5. Wessels, Elria (2009). "Boers positions in the Klipriviersberg". Veldslae-Anglo-Boereoorlog 1899–1902. Archived from the original on 14 February 2013. Yap, Melanie; Leong Man, Dainne (1996). Colour, Confusion and Concessions: The History of the Chinese in South Africa. Hong Kong: Hong Kong University Press. p. 510. ISBN 962-209-423-6. John L. Scott (2007). 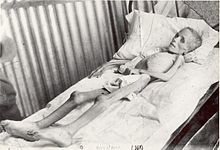 British Concentration Camps of the Second South African War (The Transvaal, 1900-1902). Gooch, John (ed.). The Boer War: Direction, Experience and Image. London: Cass. p. 179. – an anthology frequently citied in this article. Ockerbloom, John Mark, ed. (2017). "South African War, 1899–1902". The Online Books Page. – a Boer War bibliography of on-line books. Reitz, Deneys (1929). Commando: A Boer Journal of the Boer War. OCLC 801364049. Wikimedia Commons has media related to Second Boer War. 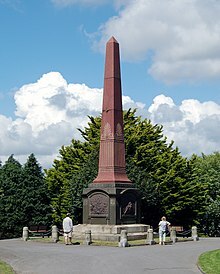 Wikimedia Commons has media related to Memorials of the Boer wars.